Women in Security and Privacy (WISP) works to advance women in the converging fields of security and privacy. We accomplish this by providing practical and technical workshops, TANDEM mentorship programs, leadership training, job board postings, Equal Respect speakers bureau, and conference and training scholarships. Last year we sent 57 women to DEF CON as a part of our WISP DEF CON Scholarship Program! Thanks to hundreds of individuals and companies who donated $780/scholarship we were able to provide a free DEF CON badge ticket, a $500 stipend for travel/accommodations, and a community support system and events for our WISP DEF CON scholars. This year we are starting even earlier to provide as many scholarships as possible for our WISP DEF CON program! Women can apply here for the scholarship (we are inclusive in our use of the word women and welcome women and non-binary people to apply. Trans women are welcome because trans women are women). Steps to donate and an overview of our Sponsorship and Scholarship Levels and Offerings is attached. Those who contribute 1+ Scholarship will be thanked via social media (if they so choose). Meet some of our WISP DEF CON Scholars from last year here: https://www.wisporg.com/blog-posts/2018/8/5/wisp-def-con-scholars and learn more about our programs and the impact of WISP DEF CON in our 2018 Annual report here: https://www.wisporg.com/blog-posts/2018/12/23/wisp-2018-annual-report. Don't miss this opportunity to network with colleagues and learn about the latest information security, privacy, and risk management innovations, strategies, and collaborations in higher ed. Workshops, track sessions, and lightning talks will cover a broad range of skill levels and topics, both technical and strategic. Join the 17th annual Security Professionals Conference in Chicago, Illinois, May 13–15, 2019. Registration opens the week of January 28, 2019. With Ireland’s established position as a global technology hub and gateway to EU markets for many leading US companies, the Irish Data Protection Commission has an important and influential role in enforcing EU privacy and data protection law. We are delighted to invite you to an interactive forum which will provide attendees with invaluable insights from Deputy Commissioners, John O’Dwyer and Dale Sunderland, on the application of the GDPR regime in Ireland. In addition, leading privacy specialist, Adam Finlay, will discuss how US companies are addressing and mitigating GDPR compliance challenges and Kenesa Ahmad will provide commentary from a US privacy perspective. The technology landscape is rapidly changing and is forging a new era in privacy. Privacy leaders with diverse perspectives will explain opportunities and challenges for the privacy road ahead. GDPR and the California Consumer Privacy Act, among others have and will make great waves in privacy. Experts will bring the new privacy dynamic into focus and explain what it means for us. With so many changes in the privacy ecosystem how can companies not only comply but break through as leaders in privacy? Viewers/attendees will learn these key takeaways and more. Advances in technology such as artificial intelligence to the human body acting as the computer interface mean privacy will take on even greater significance. Experts will highlight why our actions now will drive tomorrow’s outcomes. Join Focal Point and Women in Security and Privacy (WISP) on January 23, 2019, for an afternoon of knowledge-sharing and networking with security and privacy professionals in the Tampa Bay area. The event will include a panel discussion with privacy and security leaders, light h'orderves and drinks, and good conversation. This event is free to attend and sponsored by Focal Point Data Risk. All we ask is that you RSVP at the form on the right. May 2018 marked a change for privacy and cyber security professionals. When the EU’s GDPR went into effect, it set off a chain reaction around the globe as more countries released their own revamped privacy laws. That same month, NIST released a significant update to its Risk Management Framework (RMF) that included a greater focus on the role of data privacy in cyber security. In late 2018, a second revision of the RMF was published. The relationships between cyber security standards and frameworks like NIST SP 800-53 and ISO 27001 and new global privacy legislation like the GDPR. How NIST connects key privacy components of the RMF and the measures found in Cybersecurity Framework (CSF). Building a unified framework that aligns privacy principles and security measures to ensure the protection of personal data and compliance with key regulations. The impact of this shift on risk management professionals and what you can do as an individual to adapt to this growing trend. The Open Web Application Security Project (OWASP) Los Angeles Chapter has teamed up with the Orange County, Inland Empire, San Diego, Santa Barbara, and San Francisco Bay Area Chapters to bring you another great AppSec California. Join us and your peers for amazing talks and networking on January 22-25, 2019! Conference keynotes and sessions by world renowned speakers will follow on January 24th and 25th. Cybersecurity Career Accelerator Expo 2018 is part of the “Include Cybersecurity” initiative focusing on cybersecurity workforce development in the Sacramento Valley. Our mission is to spark interest within traditionally underrepresented groups in exploring an exciting and rewarding career in cybersecurity. Come and join our efforts in increasing the percentage of women (who account for only 18% of all cybersecurity professionals) and minorities (approximately 26%) in cybersecurity. We hope that by collaborating with IT companies, recruiters, academics, other special interest groups and cybersecurity industry experts, we can join the ranks of advocates bringing about positive and significant change in cybersecurity, primarily in diminishing the deficit of women and minority cybersecurity professionals and leaders. The Cybersecurity Career Accelerator Expo 2018 program is an opportunity for anyone interested in cybersecurity to come receive – and share – useful and relevant information critical to launching – or advancing – a career in cybersecurity. This day-long symposium will be divided into two tracks with sessions designed to benefit novice, entry-level and advanced cybersecurity professionals. The content will be presented in a combination of lectures, workshops and expert panel formats. Network with others either currently in cybersecurity, or sharing an interest in starting a career in cybersecurity. The way to effective and positive change is action. To start a wave where there currently isn’t one is what the Include Cybersecurity team is all about. Together we want our City of Sacramento be put on the map as a trend leader in developing a diverse cybersecurity workforce across the nation. It is a big challenge, but one we know we can accomplish with support from city and industry leaders – and you! Join us in this worthy initiative. Become a change agent and a believer who knows we are critical to improving national and personal security. Co-founder and Partner at Aleada Consulting, where she advises clients on privacy, data protection, and information security issues. Intel veteran of 20+ years and has held a variety of roles over this time. Join other aspiring female software engineers in finding the best coding bootcamp for you. In partnership with Career Karma and Slack, Women Who Code SF is hosting a panel of successful female software engineers who got their start from a coding bootcamp. The goal is to help attendees answer the question: how do I choose which coding bootcamp to attend? After the panel, we'll be bringing Career Karma's Peer Circles in person to discuss the panel and help jumpstart your coding journey. Peer Circles are small groups of people who are all at a similar point in their careers and gather (both online and in person) for the purpose of advancing their careers. In addition to the panel and peer circles, executives from the top bay area coding bootcamps will be available throughout the evening to answer questions about their programs, including Kriti Parashar (App Academy Management - 10x Club) and Kira Hernandez (Trilogy Education Services Managment). 5:30pm: Doors open and food and drinks are served. Attendees can network and learn more from top bay area bootcamps before hearing from the experiences of the panelists. 7:15pm: The panel concludes and attendees can then join an in person Career Karma peer circle to discuss the panel and take action on choosing a bootcamp. Note: While the focus of this event is on the experiences of women and their experiences with coding bootcamps, men are welcome to attend and are likely to find relevant insights as well! Women in Security and Privacy (WISP) and BishopFox would like to invite you to a live demonstration and hands-on workshop that will introduce you to the top three tools needed to get started in network penetration testing. We'll cover how to scan for vulnerabilities with the Nmap scripting engine, create reverse and bind shells with Netcat, and scanning and exploiting a variety of network services with Metasploit. 5:00 - 6:00 pm - Virtual Machine Setup. This is crucial to the success of your ability to participate in the class. She is a recipient of the SANS CyberTalent Immersion Academy scholarship, and is an active CTF participant. Kelly has competed in the NetWars Tournament of Champions. In addition, she volunteers with her local hackerspace, Noisebridge, where she organizes Infosec Lab Nights and mentors aspiring penetration testers. 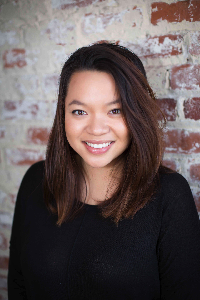 Cecillia Tran is a Security Analyst at Bishop Fox where she specializes in application penetration testing, network penetration testing, source code review, wireless penetration testing, and social engineering. She was previously an engagement manager for nearly two years. Thanks to our Gold sponsor, HackerOne, for hosting the event! Women in Security and Privacy (WISP) and Dropbox would like to invite you to an interactive presentation on security incident detection and response. Our speakers will share their experience working in today's detection and response ecosystem and discuss topics such as why an incident response team is important, what an incident response team looks like, what types of things they work on, what an incident response (IR) plan is, and provide practical guidance how to conduct security tabletop exercises that you can take back to your team. The presentation will include an interactive discussion and will be followed by networking and sharing of best practices, including beverages and food provided by Dropbox. Mel Masterson has worked in the IT and Information Security space for 17 years. She is a Sr. Threat Response Engineer and focuses on threat detection, incident response and vulnerability management. She is passionate about advancing women in technology and is the Events Lead for Women in Security and Privacy where she organizes hands-on information security and data privacy workshops for women and men in the Bay Area. Sean has spent more than 12 years in the IT security space. He has primarily worked in the national security space as a cleared government consultant supporting offensive and defensive operations. He has also working with telcomm's, financial groups, and trained federal law enforcement. He is currently the Intrusion Response manager at Uber. Sarah is a Security Engineer in the Detection, Alerting, and Response (DART) Team at Dropbox. She has spent the last 2 years working on building detections, and monitoring solutions for cloud providers. She is passionate about scaling, and building intelligence into security monitoring, and response. Prima is an experienced Information Security professional who has worked in a variety of industries such as Oil & Gas, Media and Fintech. She is a Senior Security Engineer in the Detection & Response team at Marqeta where she enjoys creating automation tooling for Incident Response and occasionally dabbles in Security DevOps. She is very enthusiastic about encouraging more women to be in technical roles and was invited to speak at the prestigious Grace Hopper Conference last year on 'Security Engineering & The Right Tools'. Trish is a Security Engineer at Twitter, where she focuses on Incident Response. Trish has a background in systems administration and spent the last six years in Security, starting out as a penetration tester and moving into blue teaming. Trish is currently working on her forensic certification with IACIS and is actively looking for a forensic study buddy. With a security career spanning 16 years from the US Government to Disney and now to Slack, Ally has held a number of roles including researcher, foreign partnership liaison, leading blue and red teams, IR, and threat hunting. She now leads the fast-paced Detection and Response team at Slack and is passionate about getting more women involved in information security. Thank to our Gold sponsor, Dropbox, for hosting the event! Women in Security and Privacy (WISP) and HackerOne would like to invite you to h1-702 2018 to meet with WISP members, HackerOne staff and other up and coming hackers in the security industry. You'll get the opportunity to network, learn, and work with others who are interested in developing their skills to start hacking in this fast growing community. The event will be hosted outdoors at the rooftop of the W Hotel. There will be complimentary food and beverage. Please make sure to bring a computer that can connect to the internet via WiFi. Tiffany Long is HackerOne's Community Manager. Formerly Community Manager at OWASP, Tiffany worked in international relations in Washington DC and India and volunteered in online feminist communities before moving to tech. She is passionate about connecting people and resources to create better civic communities and make the internet safer. Jesse graduated from the School of Informatics at Indiana University Bloomington with a passion for security and set off to Washington D.C. to work in the NSA Threat Operations Center. During her 5 year term spanning multiple three letter agencies, she worked on various National Security research and development projects. During this time she also completed her Master’s in Computer Science with a focus on digital forensics. In 2014, Jesse returned to Indianapolis to take on a role at a leading energy company in which she focused on building out modern cloud applications. Her interest in cloud technology led to her next role at Salesforce where she was in charge of hacking the product ecosystem. Today, Jesse is the Director of Product Security at LifeOmic, a biotech company focused on precision health. Jesse has presented her offensive security research and tools at leading conferences around the US, including DEFCON and BSides Las Vegas. A self-proclaimed serial hobbyist, Jesse enjoys picking up new skillsets and is always up for a challenge. Jobert Abma is the Co-Founder of HackerOn. He is from The Netherlands and is based in San Francisc. Jobert was selected to the Forbes 30 Under 3 list in 2017 for the Consumer Technology category. He enjoys the intellectual challenge of creatively overcoming limitations and is very passionate about hacker education. He can solve a Rubik's cube in less than 60 seconds. Thanks to our Gold Sponsor, HackerOne for hosting this event! Join Women in Security and Privacy at Black Hat to mingle and network with privacy and security professionals. Also, consider becoming part of the Women in Security and Privacy Tandems program. It’s our peer-to-peer mentorship program, which connects you with a partner who has a different background, expertise, and a different network. Why? We believe that you bring unique value to your women peers, no matter which career stage you’re at. Knowledge is fluent and leadership manifests at every career level. You can find your Tandem partner right here, and sign up to be matched in our next round of the program, starting in September! Join us and help to shape the future of WISP New York! Help provide valuable input to shape the future of WISP NY through a facilitated focus group discussion. We will conclude the evening with an opportunity to network with your peers and build important relationships in the community. Prior to signing up, we kindly request that you complete our quick, 6-question survey here. Appetizers and Drinks will be provided. Thank you, PWC, for hosting the event! Women in Security and Privacy (WISP) would like to invite you to Intro to Crypto and Privacy Village. Come hear from Whitney Merrill, founder of the Crypto & Privacy Village at DEF CON about what to expect in Vegas this year. She'll also provide tips for submitting to CFPs (Call for Papers). All are welcome! Thank you, LendingClub, for hosting the event! Welcome to the SECTF WISP DEFCON Prep Series! Get ready for Social Engineering village with this talk and hands on mini OSINT CTF! Social Engineering (SE) is one of the most severe threats to security and privacy because anyone can do it - even a noob. This talk outlines real-world SE examples, and seemingly innocuous information that could compromise a company. Learn the methods SEs use to mine data and exploit behavior to own targets, and how women are uniquely skilled as SEs - from a 2016 and 2017 DEFCON SE Capture the Flag winner. NOTE: If you would like to participate in the mini OSINT CTF we encourage you to bring a laptop. Participation is possible from a phone or tablet but using a laptop is easiest for our participants. Rachel is the CEO & Co-founder of SocialProof Security where she helps people and companies keep their data safe by training them on social engineering risks. Rachel also placed second two years in a row in the DEF CON hacking conference's Social Engineering Capture the Flag contest. In her remaining spare time, Rachel works as the Chair of the Board for the nonprofit Women in Security and Privacy (WISP) where she empowers women to lead the converging fields. After she gets to inbox zero, she watches David Lynch movies with her husband named Evan and pup named Snugs. Rachel Tobac (@racheltobac) was a winner of the wild spectator sport - the 2016 DEFCON 24 SECTF competition. She has shared her animated story, OSINT experience, and the modern threat of Social Engineering with USA Today, IAPP Privacy Pro podcast, and Vince in the Bay podcast. She is scheduled to speak at The Grace Hopper conference and will give a keynote at Structure Security conference this year. Rachel works at Course Hero, an online learning platform, in Community Management, User Research, and Security Awareness. In her spare time Rachel works as the Creative Director for the nonprofit, Women in Security and Privacy (WISP), where she empowers women to lead the converging fields. In the rest of her limited spare time she watches David Lynch movies with her husband named Evan and pup named Snugs. Women in Security and Privacy (WISP) would like to invite you to a Wireless Security workshop. Shannon Morse of Hak5 will explain the foundations of the WiFi Pineapple, how to use this popular penetration testing device, and how to protect yourself in a wireless environment. We will giving away some WiFi pineapples and other swag! Appetizers and Drinks will be provided. Thank you, Google, for hosting the event! The Los Angeles Chapter of ISSA has long been an ardent supporter of diversity in the field of Information/Cyber Security. Our annual Security Summits have always had many women speakers and each year we have featured a Women in Security Panel. At Summit 9 in 2017, 7 of the 15 speaking sessions were top women executives from around the world representing information security, privacy, and other technology-oriented fields. The fields of Information Technology and Information Security have had a problem attracting and retaining women professionals. This must change! It is becoming particularly crucial not just to give women in our society the opportunities they deserve, but we must address the current and projected vast shortage of qualified IT and InfoSec professionals. The deficit of women in IT security begins at a young age, when too often girls are dissuaded from pursuing studies in science, technology, engineering and mathematics (STEM), subjects that can form the foundation for the pursuit of a career in IT Security. Girls need to be inspired to choose careers in Cyber Security, and role models are crucial to attracting young women into the field. This is why it is so important to ensure that all of our events have a focus to have female representation. There has been a lot of discussion lately, on social media and in blogs, about increasing the number of women in cyber security, but there still remains an ugly side to this: discrimination. Sadly, most women in security have experienced some kind of discrimination during their careers. Men in the field have to have sensitivity towards the prevailing atmosphere and respect and appreciate women in security. Sandra Lambert, CEO at Lambert & Associates, LLC, and Co-founder of ISSA Intl. Shannon Lietz, Director, DevSecOps, Intuit Inc.
Georgia Weidman, CTO at Shevirah, Inc.
Hala Al-Adwan, VP of Technology, Signal Sciences Corp.
Cynthia Stamer, Management & Regulatory Attorney at Cynthia Marcotte Stamer, P.C. Samantha Davison, Security Engineering Manager at Snap Inc. While we proudly stand alongside our women in security colleagues, ISSA-LA is all about a diverse and open community; everyone, regardless of race, gender, religion and experience level, is encouraged to attend and participate. Ira Winkler, Robert Hansen, Mark Weatherford, Jim Manico, Kevin Cardwell, Malcolm Harkins, Jeff Bardin, Chris Eng, Gunter Ollman, Jerry Sto.Tomas, Mike Villegas, and Alex Wood. ISSA-LA, the founding Chapter of the Information Systems Security Association in 1982, is the premier catalyst and information source in Southern California for improving the practice of information security. The Chapter provides various training classes for information Security and IT professionals throughout the year and at the Summit. ISSA-LA has a CISO Forum that meets quarterly at various companies throughout Southern California. The chapter meets monthly and regularly collaborates with other IT and InfoSec organizations, having joint meetings with ISACA, OWASP, the Cloud Security Alliance, HTCIA, and the Association of IT Professionals.